The rise of Bio Rider! From the popular Kamen Rider Black RX TV series. Highly detailed SH Figuarts action figure measures 6-inches tall. The Prince of Anger comes with interchangeable hands and his Bioblade weapon! Prince of Anger! Do you collect Kamen Rider? If not, maybe you should. 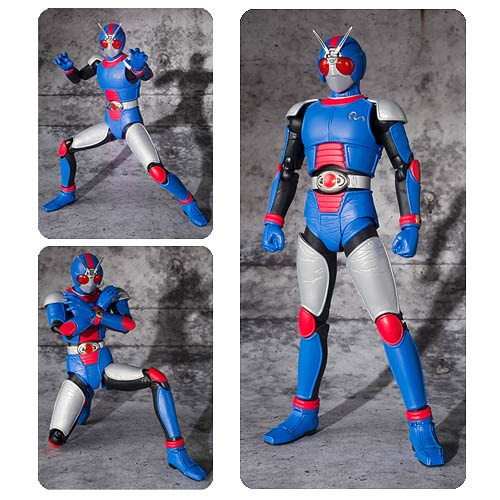 From Kamen Rider Black RX, comes this remarkable SH Figuarts Bio Rider action figure. Each crease in his armor is so intricately detailed you'll think he just walked out of your television screen! Along with Bioblade, the fearsome saber form of Revolcane, the figure also includes 5 interchangeable hand parts for even more posing possibilities. From Bandai Tamashii Nations, this articulated Kamen Rider Black RX Bio Rider SH Figuarts Action Figure measures nearly 6-inches tall. Imported from Japan. Ages 15 and up.